18mm Snap Off Utility / Craft Knife Handles only! Ebay rules states no blades to be supplied with knife handles. as well as many other DIY & crafting applications. 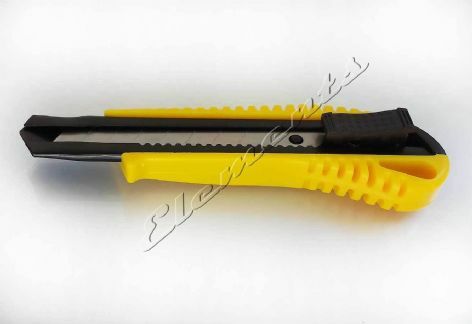 Easy and quick blade change by pulling out black plastic insert at the handle end. This handle is made from plastic with steel blade guide! It has a multi position push button for quick and easy use. Quick blade change by pulling out black plastic insert at the end. The knife handles accept the standard 18mm size snap off blades. Ergonomically shaped, strong and rugged design!